Airline reservation systems were first introduced in the late 1950s as relatively simple standalone systems to control flight inventory, maintain flight schedules, seat assignments and aircraft loading. The modern airline reservation system is comprehensive suite of products to provide a system that assists with a variety of airline management tasks and service customer needs from the time of initial reservation through completion of the flight. For an Airline, the reservation system is a mission critical system and Videcom provide a complete hosting solution for airlines and their reservation systems. Videcom use that latest state of the art technology to provide airlines with a system for all their flight reservations on a robust platform which is flexible and can adapted to any style of airline. Secure and stable systems are vital to the airline industry which is why Videcom has spent many years designing an architecture specifically suited to the nature of the airline industry which often requires 10’s of 1000’s of users to access and use the system simultaneously. With all users of the system being online at all times the system keeps track of inventory and passenger booking s in a real time environment, and updates instantly with all transactions. The Videcom internet based system offers all of the capabilities of the traditional computerized reservation systems, but in a customer-friendly format that is easy to use and understand and always online. The Videcom Airline Reservation System provides a modern, flexible reservations and inventory management solutions for Airlines including call centre, travel agency, internet engine, GDS and interline booking. By implementing the Videcom system, airlines can ensure that reservations can be generated not only by their own airline staff, but also by any travel agent using a GDS system or other airlines that have a Multilateral Interline Traffic Agreement using our interline interface. Code-sharing, a scheme designed to alleviate the screen order bias in the GDS systems is also supported by Videcom allowing airlines to use a 4 digit flight code designating that another airline operates this flight. The booking made in the system is also sent to the other airlines reservations systems and PNRs co-exist in both airlines systems. The Videcom reservations systems is a sophisticated suite of products and is able to offer customer services such as e-tickets, hotel room reservations, rental car reservations, frequent flyer program mileage, and provision for special meal requests. Airlines use our Reservations System to fully manage there inventory and yield/revenue to maximise their profits. The systems also provide airlines management assistance by addressing financial, administrative, back office issues, scheduling, airline load data, decision support for control of overbooking, discount seat allocations, and yield management that can be used to adjust the number of special fare seats based on the number of reservations. Enhancements are made to the systems with the understanding that interruptions in service are not acceptable. To be successful Videcom acknowledge reservations systems must be reliable with a very low failure rate. Hardware and software redundancy for immediate backup in the event of a failure is an absolute necessity. Airline ticket agents can access the reservation systems to make flight arrangements, view current reservations, and check passenger lists, as well as many other functions. Airline agents as well as travel agents can issue both paper tickets and e-tickets for a booking made on the system which conform to the IATA standard. E-tickets are also issued online via the internet booking engine for any booking made by the public. Online Direct Internet Access for the public to make a booking with the airline through the internet booking engine. Direct travel agency sales via a secure online internet booking engine providing a booking facility for travel agents without GDS and BSP fees. Native Mode booking interfaces with a direct connection to the reservation system for airline staff and travel agents with experience of tradition style airline reservation systems. An interlining interface which allows airlines to make a booking on and receive bookings from other airlines on other reservation systems. 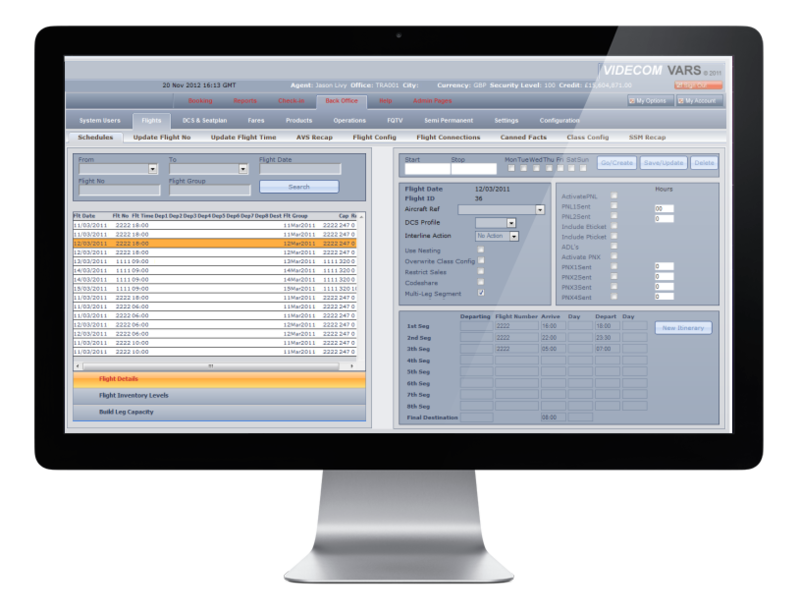 GDS interfaces to the Videcom reservation system allowing any travel agent using Galileo, Sabre, Worldspan, Amadeus or Abacus to make a booking with the airline .